We recommend Rotadent. It has a small head that spins 360 degrees that helps you access hard-to-reach areas of your mouth. This aspect is more important when you are talking about someone with orthodontic braces or a history of gum disease. 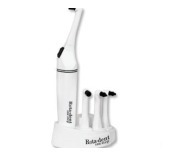 Rotadent microfilaments reaches areas that standard bristles may not be able to access. If you have any questions about electric toothbrushes and you live in Ottawa or surrounding area, give us a call today!